Back on the road again - this time for the annual parish retreat. Got hundreds headed this way - and where is "this way?" Why, it's the great state of West Virginia! The one thing I did discover all ready is that it's quite an adventure to be in the middle of beautiful countryside, not a soul in site for miles, and the the GPS no longer picks up the satellite. I guess Senator Byrd is powerful (it's hard not to imagine that there is an entire city built underneath West Virginia for the U.S. Government, just in case), but not so powerful as to get the entire State of West Virginia covered. Gave new meaning to the phrase, "wilderness experience." 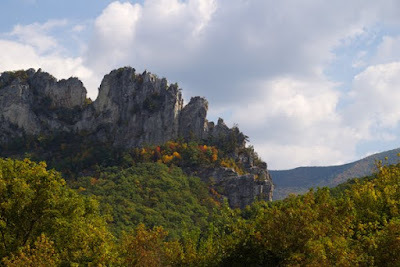 Did pass some amazing scenery called Seneca Rocks. Simply breathtaking! Drove by it twice because of the darn GPS was stuck and it took many miles before I realized that the turn had been five miles away for twenty miles. But the scenery was nice. So - yes, here in West Virginia. And of course, what other song could come to mind as one wanders through the back roads (that got thinner and thinner and thinner), but this classic. Gosh, I still miss him!! I lost track of how many times I saw him in concert - but a special one was third row in London when I studied there in my junior year in college. He brought a bit of America over just in time. I like this arrangement very much - this is how it felt wandering about the country roads today, especially when I found a West Virginia State Trooper sitting on the side of the highway waiting for big city speeders. He actually took the time to write out directions (complete with landmarks) for me as he sat in the front seat of his way-cool high-tech SUV. Have a feeling his GPS works just fine. 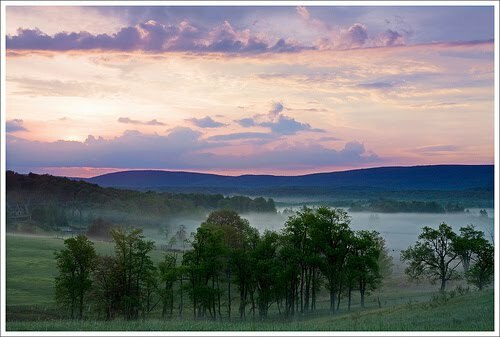 We used to live in western MD and would take weekend drives through West Virginia. It was incredibly beautiful. Glad you're enjoying it and listening to John Denver. I'd always picture those drives when listening to his music. Great picture Mary. Takes me back to my seven years at Fort Ritchie, MD. Pray its a time of blessing for you and the Truro family. I still think of this as western Virginia. Alas, not Shrine Mont :( There is nothing like Shrine Mont, it is so very special. But Canaan Valley is spectacular in a different way. Of course, what makes both special at the end of the day are the people. "not a soul in site for miles, and the the GPS no longer picks up the satellite." YOUR GPS no longer picks up the satellite. When you are outdoors, there only a couple of things that interfere with a GPS. Overhead interference from things like trees. Sometimes deep canyons cause problems because a GPS uses multiple satellites for location. If it can't pick up satellites on the horizon this may hinder locating.So it is not the fact that you are in the "boondocks". Maybe you don't have map data for that area.